After a summer that saw a flurry of activity, Borussia Dortmund were expected to stay quiet during the winter transfer window. This could now change as Adrián Ramos has just asked to leave the club. The Colombian forward, Adrián Ramos, was already linked with a move to China last winter, but was convinced by the club’s management to stay in Dortmund. Borussia proved to have been correct in retaining Ramos when the Colombian forward scored eight goals in last season’s Rückrunde, and was a major factor in the club finishing second in the league. Some suspected that Adrián Ramos would once again ask for a transfer in the summer but, with his playing time increased in the second half of last season, the Colombian must have felt that he was finally an important member of the squad. What followed, however, were just seven games in the Bundesliga in which he scored twice. With the winter transfer window opening on January 1, and Chinese Super League clubs, in particular, looking to invest big money, it was understood that a Chinese club could come in to buy Ramos in the winter. 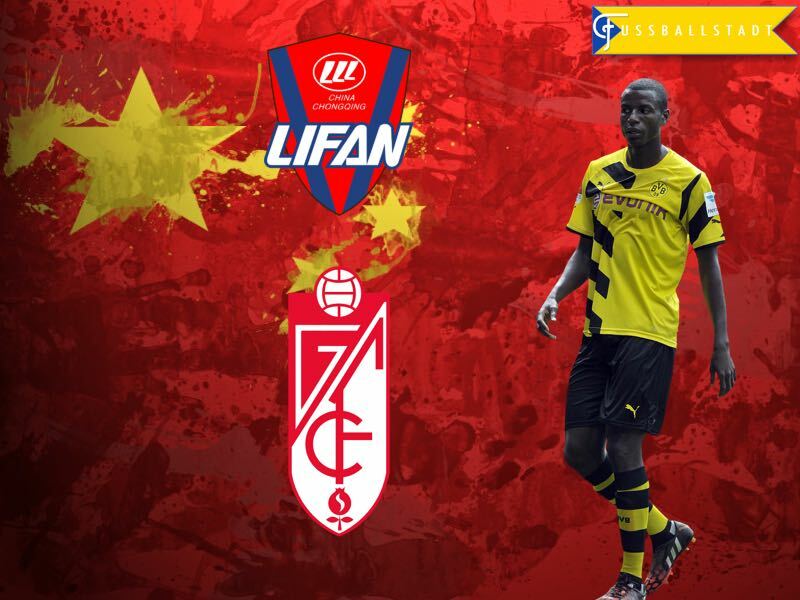 It is, therefore, no surprise that Chongqing Lifan has come in with a substantial offer for the forward. It is not just money, however, that makes Chongqing Lifan’s offer attractive for Ramos. The Chinese Super League has announced that the league will limit the number of foreigners each club can face to just three (plus one foreigner from the Asian Football Confederation). As a result, Chongqing Lifan, which currently has four non-Asian foreigners under contract, want to purchase Ramos now, but park him at the Spanish La Liga side Granada CF—Granada are owned by the Chinese businessman Jiang Lizhang, who is also an investor at Lifan. Borussia Dortmund are supposed to receive between €8 million and €10 million for the Colombian forward. Ramos has told Borussia’s management that he is determined to make the move, as he believes that he would receive more playing time at Granada. Another factor is, of course, money. For South Americans, the move to China means that their families are freed of financial uncertainty for generations, and it is, therefore, understandable that the 30-year-old Ramos is looking for one last major payday before hanging up his boots. For Dortmund, Ramos’ transfer will leave a gaping hole up front. Pierre-Emerick Aubameyang is currently at the African Cup of Nations, and will be back at the club no earlier than the beginning of February, which means he will miss the first four matches after the winter break. Furthermore, there is the question as to what will happen to the club should Aubameyang go down with an injury? Several papers in Germany have speculated that Thomas Tuchel could use the likes of Marco Reus and André Schürrle as centre forwards. But neither are natural number nines and, on top of that, both have struggled with fitness over the past few years. Another candidate up front could be Mario Götze, but those who have followed the German national team closely will know that playing Götze as a number nine is less than ideal. Consequently, talk in the German Press that suggests Dortmund is deep enough up front to continue the season without bringing in another centre forward could be somewhat unwise. It would, therefore, not be a major surprise if Dortmund actively tries to sign another forward in the January transfer window. The most obvious link has been to the Russian forward, Fedor Smolov (read his profile here). Will Ramos’ departure pave the way for Smolov’s transfer? Smolov, who was recently named the best player of the Russian Football Premier League by Russian Football News, has been outspoken about the fact that he would like to move to Germany, and that he would like to move to one team in particular. The trail has gone somewhat cold in the past week—some of this may be due to the Russian holiday period—but with Ramos now likely to leave, it is certain that Dortmund will revisit the option to purchase Smolov either this winter, or next summer, which might be Smolov’s preferred option. While Smolov and his agent have been adamant that they would like to see the powerful Russian play for Dortmund, he is by no means the only option for die Schwarz-Gelben. Another name from the Russian Football Premier League, who has been linked with a move to Dortmund, is Sardar Azmoun. Fussballstadt recently compared Azmoun and Smolov regarding their adaptability to Dortmund. At the time, we concluded that Smolov would be the better option for Borussia, which does not mean that Azmoun is not on Dortmund’s radar. The Iranian striker has the significant benefit of being relatively young, and Borussia, at the moment, seem to prefer buying young and adaptable players. Another trail leads to Gedion Zelalem from Arsenal (read his scout report here). The 19-year-old German-American forward is currently in Arsenal’s system and, at one point, produced major media hype in the United States when he declared that he would like to play for the United States over Germany. Since then, however, his development has stalled, and the experiment of Adnan Januzaj has shown that hyped players from English academies do not always fulfil the physical attributes needed to succeed in German football. At the Futbolgrad Network we, therefore, believe that Smolov remains the likeliest candidate to come in to replace Adrián Ramos. That is not say that the transfer will happen. Smolov has told Russian media that he would be happy to see out the season in Russia. Also Dortmund may stop Ramos’ transfer. One thing is for certain, however, Adrián Ramos’ current transfer situation will mean that there will be a massive focus on Dortmund’s January activities. Zelalem is NOT a forward, he’s a centre midfielder. As for young players from English academies not working out – Saying that because Januzaj proved to be lazy and unambiguous is really naive. You can’t base that opinion on one Belgian who didn’t put in the required effort, especially considering Zelalem would be used to Germany and would feel at home. Just like Gnabry and look how well he’s doing!